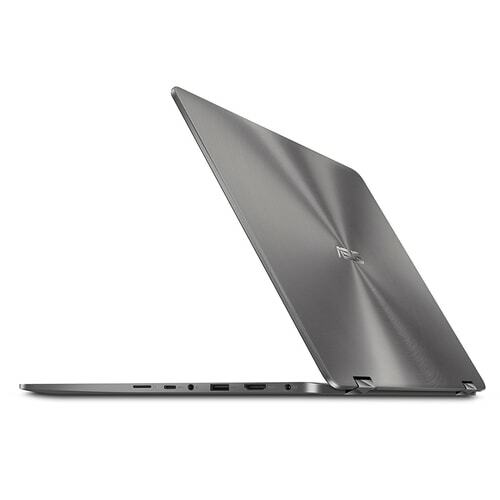 ASUS Zenbook is a stylish, slim and sophisticated laptop. The PC is not just ultra-slim, it is also ultra-portable. It comes with the fingerprint identification. The design is very attractive. The performance is extraordinary. Battery life is wonderful. The Zenbook is able to handle 3D editing and gaming reasonably. Working with graphics applications like Photoshop and CorelDraw is done with utmost ease. Zenbook design is very cool and appealing. The design is made of aluminum. It looks very compact. It comes in arch color with black bezels. It has got a 14-inch screen with 1920×1080 resolution. The laptop is able to flip 360 degrees. It is the true meaning of convertibility. 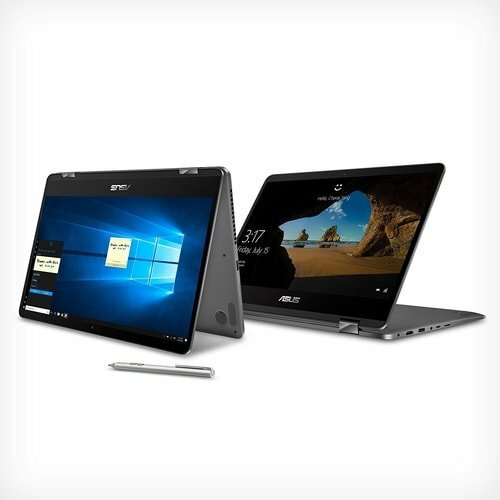 It is a 2-in-1 laptop because it can be used as a tablet too. ASUS Zenbook has got a scintillating keyboard that is well illuminated. The keys are very soft and awesome. Typing on the keyboard is a smooth ride. The typing experience is wonderful. Zenbook touchscreen perfectly supports 10 touch points. It is very responsive to touch. You can use your fingers to interact with it or use a pen that is specifically made for it but sold separately. The responsiveness of the pen is not different from what you get when you use your fingers to operate the PC. Using a pen only makes it look stylish. It has two USB 3.0 port on each side of the laptop. It has an HDMI port and a combo audio jack. There is also a USB 3.1 port. As usual, there is a micro USB card reader. 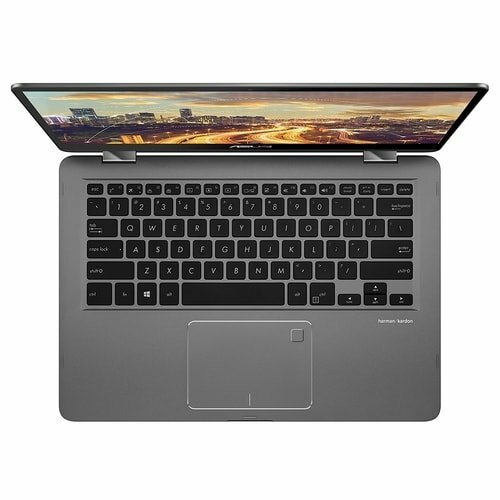 The Zenbook has no Thunderbolt 3 port. It is fitted with an Intel Core i5-8250U quad-core processor. It is an 8th generation CPU. The performance of the processor is marvelous. It is remarkably fast. Bursting with speed, the Zenbook is very reliable and dependable too. The battery life is very commendable. Whether you are working on a graphics application, editing a video or playing a game, you won’t experience any interruptions at all. 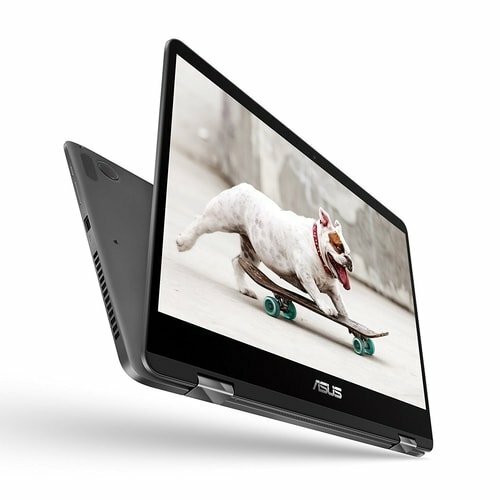 This is because the ASUS Zenbook comes with a very solid graphics cards, which is the Intel UHD Graphics 620. This graphics processor renders top-notch graphics performance. The processor boosts video display in a very respectable manner. Intel UHD Graphics 620 guarantees satisfactory user experience. Your basic games play perfectly well without any hitches. There is no heat emission from the Zenbook because the fan blows very powerfully. The performance of the fan ensures you do not experience high temperature when the laptop is in use. Zenbook has got an immersive display. The screen is glossy too. The display renders very bright, sharp and vivid pictures. The display is just too impressive. It has a 1920×1080 resolution that makes pictures look very cool and interesting. The sharpness of the display will keep you awestruck. There is a quick response when you swipe the touchscreen. You would love the display because of its coolness to the eye. ASUS Zenbook battery life is great. The battery lasts up to 9 hours. That is very incredible. It has a huge 57 Wh capacity. The battery life is enough to edit two videos and relax later to watch your favorite movies and also play games. Zenbook speakers sound fine. The bass is okay. There are no distortions because the music flows uninterruptedly. The sound is so pleasing to the ear. The sound is very distinctive from other laptop speakers. The images from the 720p webcam are relatively okay but the webcam is not bad when making Skype and Whatsapp video calls. Zenbook combination of Intel Core i5 processor and UHD Graphics 620 is a masterstroke. Having both help games to run very smoothly without hitches. Games like League of Legends will play fine but at low resolution and low-quality settings. Hardware demanding games like Final Fantasy XV won’t play on the laptop. Other games like DOTA 2 will play well too. You just have to test the games that would play well on the laptop before you immerse yourself in the game. Zenbook does not make any disturbing noise. Even if the laptop is loaded with lots of tasks, the noise still remains low. You would have to listen hard before you can hear the very low noise coming from the PC. Yet, it is not irritating. Zenbook temperature is very moderate. After running tests for 1 hour 34 minutes, the temperature of the laptop stayed at 40 degrees Celsius. That is 104 degrees Fahrenheit. The temperature is very okay. You do not feel any heat due to the fact that the fan blows so well. The performance of the fan in this regard is very astonishing. Zenbook is not a power hungry laptop. Its power consumption is normal. When the PC is unused, the power consumption is about 15 watts. When the laptop is heavily loaded with tasks, the consumption increases to 37 watts. This is still decent. The laptop’s maximum power consumption is 45 watts. The voltage of the laptop charger is 17 volts. Zenbook comes with the Intel UHD Graphics 620. The graphics card handles graphics output perfectly without any issues. It also supports DirectX 12. It runs at a speed of between 300 to 1100 MHz. The graphics card draws strength from the memory which runs in dual-channel mode. The dual-channel mode helps to provide higher performance on video and graphics. The Intel UHD Graphics 620 delivers pictures in very sparkling manner. Pictures look very exciting. Zenbook has 250 GB of storage space. Your video, music and other files have got enough room for storage. Out of the 250 GB, 205 GB is for the storage of user data. The remaining is for Windows installation. The transfer speed is very fast and inspiring. Zenbook is equipped with the Intel Core i5-8250U quad-core processor. It is also in the family of the Kaby Lake. Core i5 is a processor that makes applications to run with ease. The processor has a basic clock speed of 1.6 GHz, which is increased to 3.4 GHz on Turbo. Zenbook does not come with an Ethernet port. It has a built-in WLAN that makes use of an Intel chip, the Dual Band Wireless AC 8265. The transfer speed is very fast and reliable. Zenbook supports microSD card reader. The speed of transfer is a bit slow when copying large files. The speed ranges from 33.2 MB/s to 36.5 MB/s. Zenbook cooling system is well crafted into the hardware of the laptop. There are two heat pipes fitted into the laptop. The heat pipes are not of equal size. One heat pipe is bigger than the other. The two heat pipes are connected to the cooling fan with two heatsinks. This keeps the laptop cool all the time. Zenbook is very easy to maintain. To disassemble it, you have to unscrew the screws at the back of the laptop. You have to be very careful when unscrewing the screws so as not to break the clips. You can have access to the hardware after unscrewing all the screws. You can have access to the fan, SSD, WLAN module and battery after removing the back cover of the laptop. There are no memory slots. Zenbook is a sleek, stylish and very sophisticated PC. The display is very vibrant. The screen is glossy too. The battery life is amazing. 9 hours of performance is great. The performance of the laptop is unparallel. Combining the Core i5 processor and Intel UHD 620 graphics card makes a lot of sense. The introduction of a pen is novel. The pen makes it stylish. The touchscreen is highly responsive. With 8GB RAM, speed won’t be any problems. Well, the illuminated keyboard makes you work anywhere even in the dark. The speakers produce very quality sounds that are very comforting to the ear. Even at 40%, the speakers are banging fine. 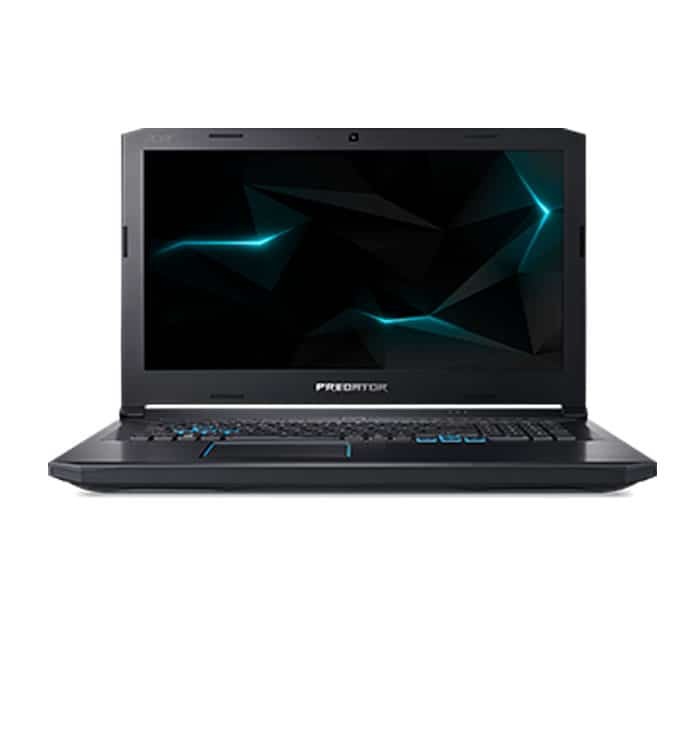 It is a laptop that is perfect for content creation. Video editing is done with ease without any issues. The cooling system is well taken care of. The fan is so powerful. It maintains coolness all through without much temperature. Best laptop at budget ever i meet for view & great specification.